If you are interested in working through all of our materials our eating disorder product bundles are the easiest way to get everything that you need all together and save money vs. buying the programs individually. 8+ hours of Video Training. This bundle offers something for every time, place and every style of learning. It will provide you with the information you need to understand why you’ve been so stuck in your attempts to get a grip on food and weight and exactly what to do to change it for good. Download now and begin to see change in your relationship with food; your weight; and your self-confidence today! Our unique and successful healing program is now available to you in a new 3 Video set! 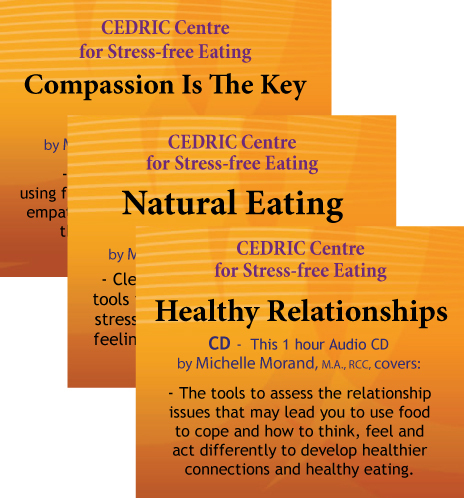 The CEDRIC Centre is pleased to offer three new educational Videos to support you in your recovery from disordered eating and the diet mentality. Whether you overeat, restrict, purge or all of the above, these videos will educate you on why you do what you do and on exactly what you can do to begin to have a peaceful and easy relationship with food while effortlessly maintaining a natural weight for your body. 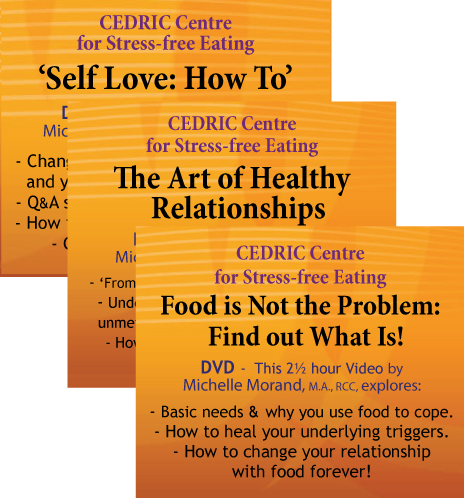 Each of these videos was filmed at The CEDRIC Centre and includes 2 ½ hours of education and information from Founder and Director, Michelle Morand, as well as over half an hour of questions and answers from men and women who are in various stages of recovery from their own use of food to cope. This 3 video set contains over 8 hours of key information for your personal growth and recovery from overeating and restrictive patterns around food. It covers the entire recovery process from a beginning awareness of what might be triggering you to use food to cope to how to create lasting change in your relationships with others and with yourself. It’s all there. The videos provide you with all the information you need and clear and specific tools to not only deepen your understanding of why you do what you do with food but to forever heal the way you relate to yourself, others and the world around you. By downloading these videos you will be able to review this transformative information as often as you like, at your own pace, in your own home. 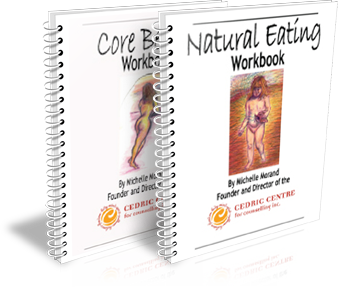 This is a comprehensive program for complete recovery from the diet mentality and disordered eating. These videos can take you from the start to the finish of your recovery process all for a price that is less than you’d pay for two hours of counseling. If you are tired of having your life ruled by food and bad body thoughts; if you’d like to feel deserving of the things you want; if you’d like to have only relationships that are life enhancing and bring out the best in you take this opportunity to create a life that is completely free from self-defeating behaviours and thoughts. It is possible, we know because we’ve done it and you will too! Download the entire set now and begin your healing journey today! Both of the workbooks for download. 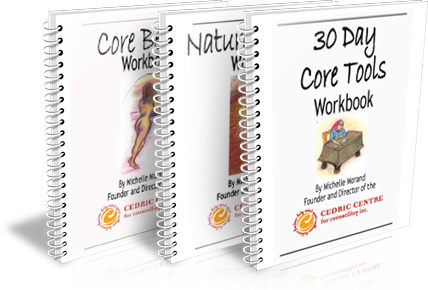 $26.99 PDF Download: 30 Day Core Tools Workbook; Natural Eating; & Core Beliefs too!